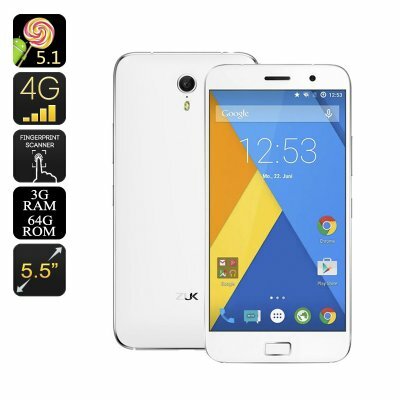 Successfully Added Lenovo Zuk Z1 Android Smartphone - Quad Core CPU, 3GB RAM, 64GB Storage, Fingerprint Scanner, 4G, Dual Band Wi-Fi (White) to your Shopping Cart. The Lenovo-backed ZUK Z1 has a lot to offer with its sleek metal frame the handset has a sturdy feel and appealing form. A full HD 5.5 inch display put the Zuk Z1 phone in the phablet category and this large screen offering boasts 400 pixels per inch. With a high brightness and IPS panel you can enjoy wide viewing angels when seeing the display indoors or out. When it comes to performance the Zuk Z1 has a quad core Qualcomm processor clocked at 2.5Ghz and 3GB of RAM making it a good deal faster than many mid ranged handsets and more than capable of running high end games or streaming HD movies. With a generous 64GB of onboard storage there is no need for a micro SD card, as the abundant memory is enough for even the most heavy users. With Wi-Fi 802.11 b/g/n/ac you can enjoy dual band (2.4GHZ and 5.8GHz) connectivity for faster data transfer speeds. The Z1 supports 2G, 3G and 4G bandwidths with the latter covering the majority of Europe, Asia and Middle East countries brining the fastest cellular connections to you. A bonus of this large screed handset is the added space that's available and this is well used to accommodate a 4100mAh battery, this brings exceptional talk times and ensures plenty of usage for movie viewing and games. The home button on the Zuk Z1 Smartphone has a built in fingerprint reader allowing for quicker unlocks. With a Type C USB port this future proof smartphone can take advantage of fast data transfer when plugged into other type C devices. The Zuk Z1 Android smartrphone comes with a 12 months warranty, brought to you by the leader in electronic devices as well as wholesale Android Phones..